I just spent much more time snowshoeing than I cared to. 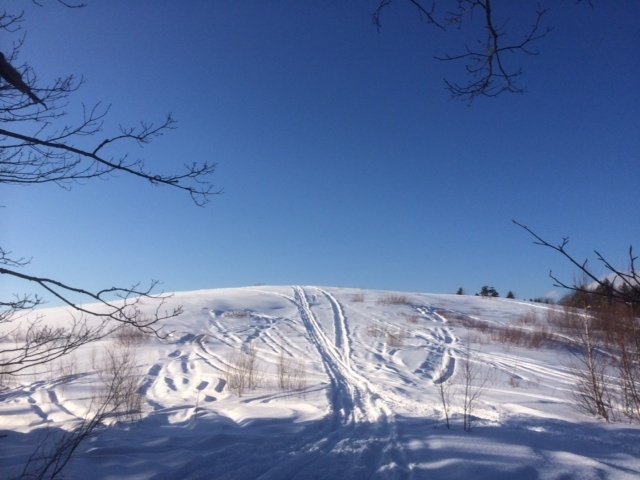 I planned to walk for about two and a half, but ended up putting in 5 hours in Camden Hills State Park, where unusually deep snow obscured the Sky Blue Trail. I knew the snow was deep out there. 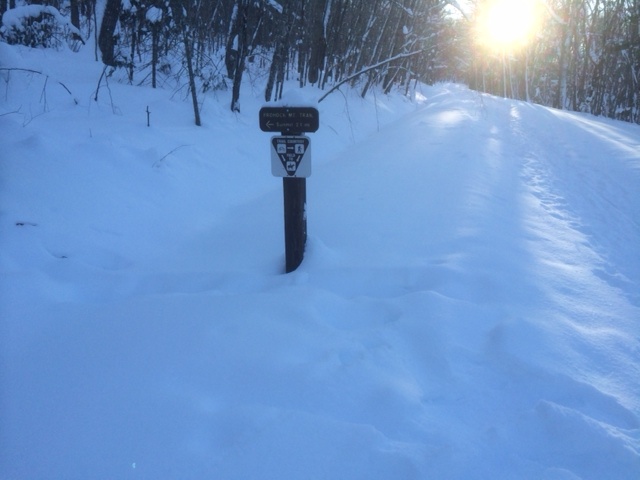 Last week, by friend Bruce and I spent some collective trail finding out on the Park’s Frohock Trail, and now there’s at least another 15” of snow on top of the record breaking 4 feet of pack. 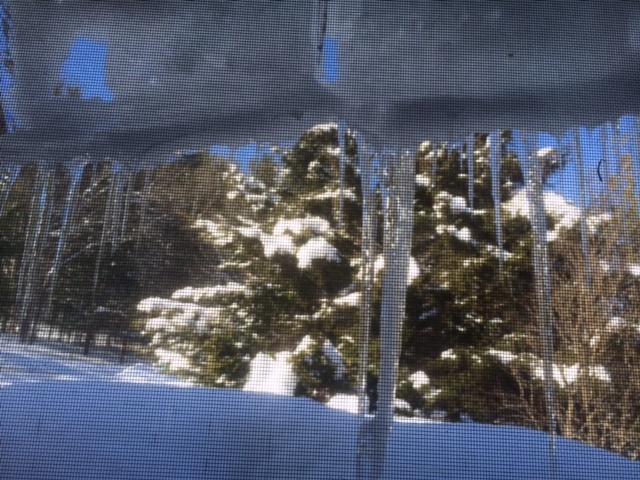 Here’s the view out my bathroom window right now. I wanted to get going by 2 pm, but misadventures in the Steven’s Corner lot pushed my start time back close to an hour. The lot was not plowed, with only a lonely Subaru wagon that had pushed it’s way in there when I arrived. I tried to get in with my Voyager, but almost got stuck and quickly backed out back to Youngtown Road. Then I grabbed my shovel and went at it, removing snow quickly with my shovel-the snow was light and fluffy still. I cleared out a parking spot for myself and was all set to try and get in there where then occupant of the Subaru skied over to his car, and then promptly got it stuck. He had no shovel, so over I went, in the true helpful spirit of my Maine Guide status. His tires were almost bald, and he was not experienced at rocking a car on snow. I had to push him out, and it took us a while. Just as I was getting into my car to get it in the lot, another car came right in, using my work, and taking my shoveled out parking space. At this point I decided to just park out on Youngtown Road, moving over as far over as could. It was now close to 3 PM. I was carrying minimal day gear, a big mistake. I strapped on my trusty MSR Lightening Ascents, slipped my hands into my Leki poles and made great time on the first 1.2 miles. I was the second person to get in there. 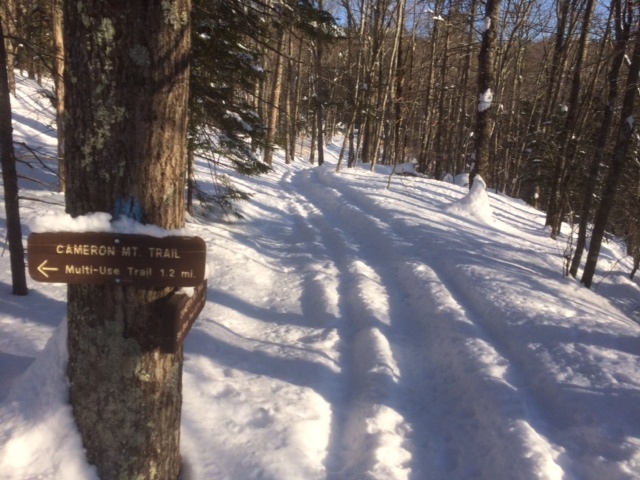 Heading onto the Cameron Mountain trail, I had a fresh snowmobile track. The left turn after passing Cameron itself onto the lesser traveled Cameron Mt. Trail was a bit depressed, and untraveled recently. Not too bad. I was now 4 miles in and the sun was still shining when I started onto the 1.7 mile Sky Blue Trail, which had vestiges of prior use written on it that soon petered out to unbroken trail. Unfortunately, I spent the next couple of hours weaving around, breaking through spruce traps, and even plunging into some hidden open water, until I stumbled out onto the Ski Lodge Trail in the dark, around 7:30 PM. My boots were soaked with ice water, and I had lost two mitten shells. I was hungry, and both legs were cramping, which also slowed my progress. I was saved by my iPhone and eTrex GPS. I was able to successfully move in the right direction by following my forward progress on the Sky Blue Trail using Guthook’s Camden Hills Hiker App, that is until the cold locked down the iPhone. 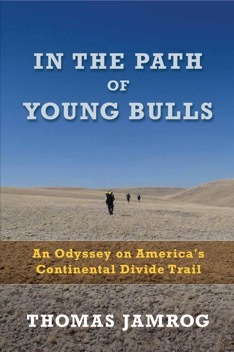 The main problem that I had was that I was also trying to read blue blazes to ensure I was on the trail. There is so much snow at the higher elevations in Camden Hills that the snow is now up over the blazes, obscuring them in places. 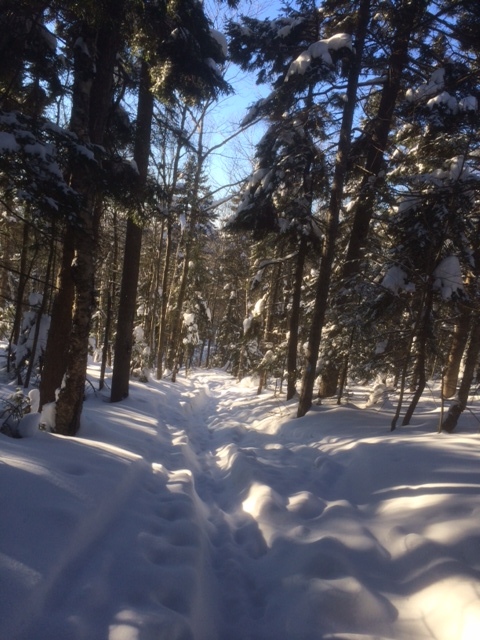 Unfortunately, the same deep snow took me over deep, loose areas where I sometimes plunged in up to my chest, wallowing around, and using up valuable energy in trying to extract my snowshoes from entanglements way down where my arms barely reached. I was thankful that I had poles to lean on and push against. I made all the classic mistakes you read about tonight-walking in circles, moving around too much, and exercising fuzzy thinking. I had a weak little micro flashlight ( with new batteries), and no headlamp. Dumb. I made a phone call to Marcia that I’d be late. Then the phone died, and soon it was dark night. I was able to maintain calm enough to haul out my GPS. I decided to forgo sticking close to the trail and bushwhack may way out. Thank God there was moonlight, and reflective snow, so I was able to see enough to discern white spaces between trees. I set myself up a “GoTo” to a way point that I established at the closest point of the easterly Multipurpose Trail, and knew all was right with the world when I made it out, where I turned left and skittered my way back down the Ski Lodge trail to my car. I was humbled, and stunned. Tomorrow I’m assembling a permanent winter day pack. I am enlisting the help of Auntie Mame to help me do this. I must smarten up and carry lots of gear in the event that I get off track again in subfreezing conditions, in the dark, where there is no trail. I have to make it home every time I go out. Now, I’ll be better prepared for the next possible disaster. [Future Post: What’s in my winter day pack ? Yup. Looks really interesting. Planning on attending this event. Sugarloaf Fat Tire Festival | NEMBA. Not Without Peril just picked up another sorry story. 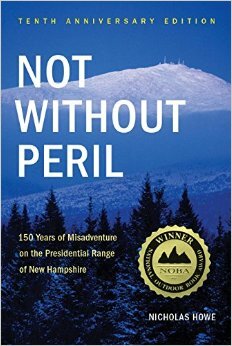 That book is fascinating read that chronicles he over 100 deaths that have occurred on New Hampshire’s Mount Washington. It’s a story we’ve read before, smart people doing dumb things in the wilderness. This one is a bit surprising, in that Kate Matrosova was the ultimate professional: super smart, driven, able to think ahead, make adaptations, and have a back up plan in place. But this death was not a freak occurrence, it was avoidable. 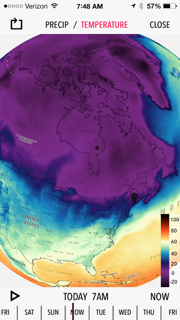 Between 3 p.m. and 4 p.m., the temperature at the summit of Washington was 21 degrees below zero. The wind was blowing 77 miles per hour, and the wind chill was -67. That evening, gusts were recorded that were up to 140 miles per hour. Yes, she had the right gear, had done these types of winter traverses before, carried a Spot, and had a plan. But, this time, it all didn’t work out, and now life is over for her, and also partly for her husband, who was waiting for her in their car for the last time, ever. In addition to inexperience, the second major contribution to her death was her not knowing that there is a major drawback to choosing a Spot location device in the depths of real winter. Who knew this? I’m really disappointed in this article. It’s pretty weak science; self-report checklists about thinking about an action while at the same time as performing the action. Mindfulness, in the way it is described here does not ring true to me. Thinking about consciousness while one is engaged in an action is a double act of attention that detracts from our engagement in the activity, whether it is exercise or washing dishes. It also is a poor substitute for putting in a daily hour of an actual meditation technique. It was a another below zero night at my house last night, with another 8″ of snow. But here, temps in the low 30’s are fine with me. I like it here, right now. It is totally flat walking, and so easy to rack up miles. I’ve logged 15.3 miles in the past 48 hours. Wow. It’s really completed ! Gonna be funny. 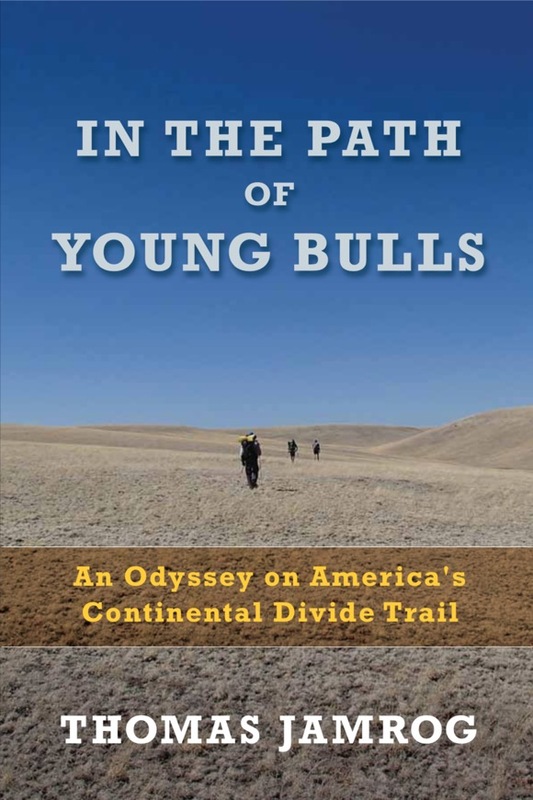 It’s been over a year since I’ve returned from completing my 2,500 mile thru-hike of the Continental Divide Trail. In October, I was fortunate enough to focus my experience, step up to the plate, and give the Keynote presentation at the Midwest Winter Camping Symposium. While attending there, I was interviewed for a series of instructional videos produced by Don Kivelus, of Four Dog Stove. Snowshoeing. It’s where it’s at right now. At Camden Hills State Park, I enjoyed a quick loop up to one of the best lookouts around these parts- Bald Rock Mountain, elevating itself a mere eleven hundred feet above adjacent Penobscot Bay . Here’s the map of the loop. 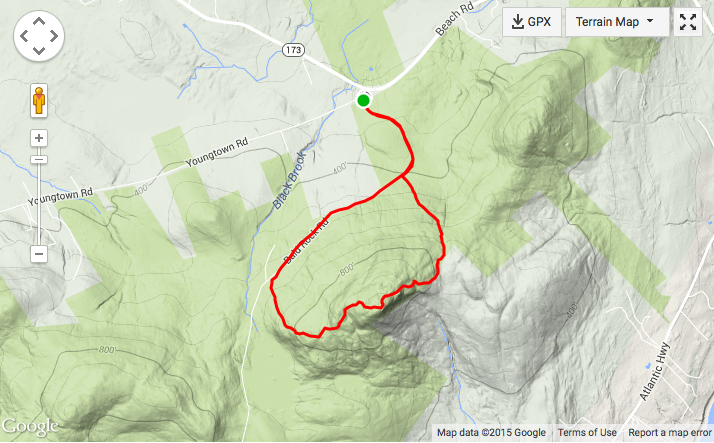 I had originally planned to head out to Frohock Mountain, but that trail had not been broken out, and I wasn’t sure I had the time to head out there and back before dark. There is a lot of snow here. Several places in Maine broke the all time record for 10 day snowfall totals- approaching 6 feet. There is three to four feet of snow out here and it is still powdery. Frohock is the hill just northeast of this loop. I would like to get out to Frohock, but want someone go with me so that we can take turns breaking trail. 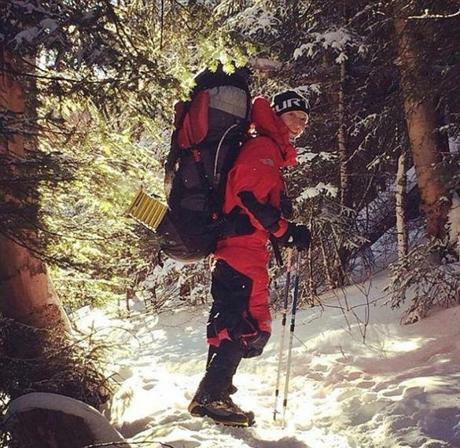 I just got this crazy idea to snowshoe all 27.5 miles of trails here. I hiked right up the Multiuse Trail, then took a left a half mile out to veer toward Frohock. I made it all the way to up the summit of Bald Rock Mountain where no one had yet broken a trail from the lower lean-to up to the summit. 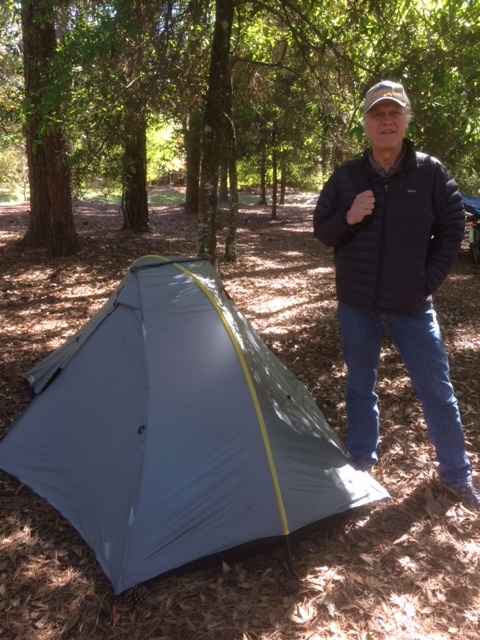 Here’s the second (upper) lean-to, a place where folks like me can stay the night for a quick local adventure. After I hit the shelter, I slogged up the steep granite ledge to the top, which was buried in snow today. I was alone, but had dozens of islands to communicate with from the top. This hike is so good. After you take in the view, it’s really all of two complete miles of downhill to the Steven’s Corner parking lot. I like completing this hike in the late afternoon, when the sun is starting to set. I plan to journey out to Frohock this coming Saturday morning at 8:30. If any one else wants to help me break trail to Frohoc before the next blizzard comes in Saturday afternoon with a foot or more of new powder, come on by. I first heard about it on a music blog that I subscribe to- Bob Lefsetz’s blog. Here’s his own introduction to Dark Sky. This is an interesting read in itself. Dark Sky is highly interesting. 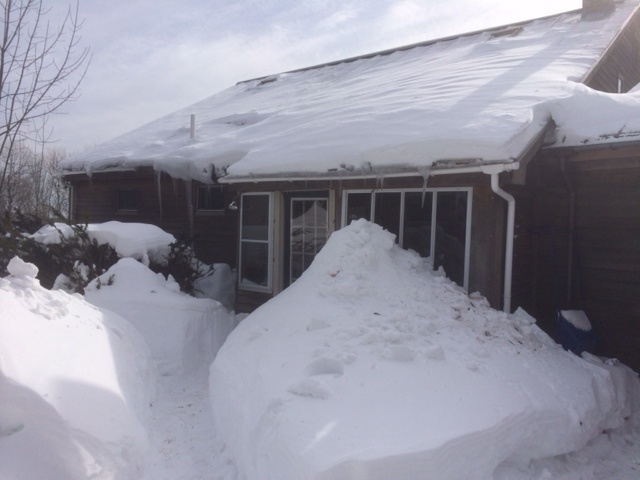 We’ve had almost daily snowstorms in Maine in February, totaling over 4 feet of accumulated powder since Jan. 29. For this last storm, Dark Sky was the only weather program initially forecasting snow on Sunday ( yesterday)- we got a total of 5 “ here. 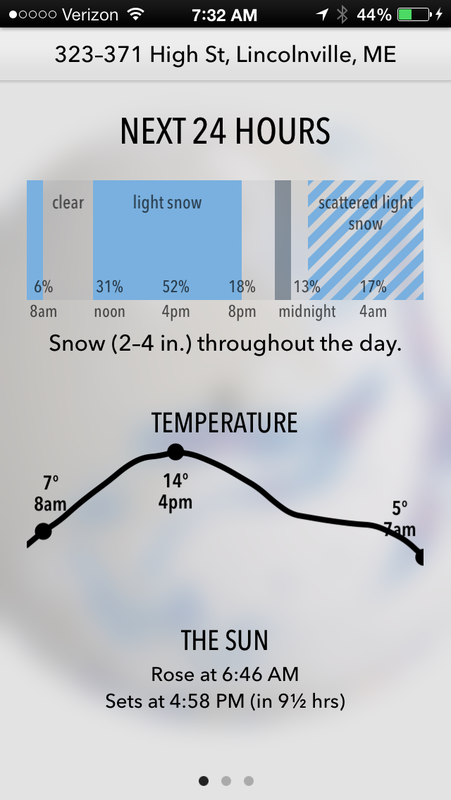 I’m not aware of any announcements like this on other weather apps: “Snow starting in 14 minutes ,” and even more amazing is that it actually comes true-most of the time. I want to be outside every day. I now plan my bike rides and hikes around Dark Sky. If there’s a break in the weather, I get an announcement about it. No only does DK let me know how much snow is going to fall today, it’s telling me when and how much at differing times during the day. The maps are stunning. You toggle back and forth between precipitation and temperature. Here’s a screenshot of the temp today. What you don’t get with this pic is that it’s a video clip with the actual movement of these large radar progressions pulsating for the upcoming week. It’s a heck of a snowy sub zero ride this week in Maine, but I’m digging charting it with Dark Sky. The bad news for some folks is that it’s only available for the iPhone-sorry, no Android. 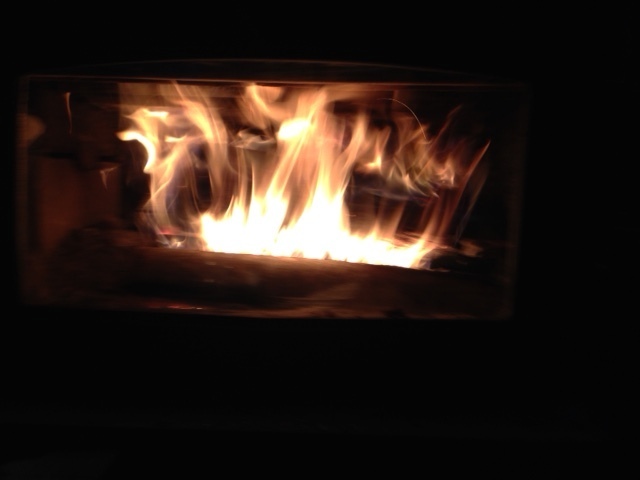 Forests for Maine’s Future – Fresh from the Woods Journal – Wood: an enduring energy source. I have my energy source at hand, and plan to keep it that way. Small house, highly insulated, southern exposure, and 5 acre plot of land, mostly wooded. I’m good with wood.